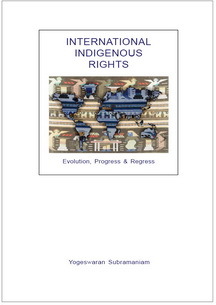 This booklet concisely traces and evaluates the development of the rights of indigenous peoples internationally - from the time of European colonization in the late 15th century until the approval of the United Nations Draft Declaration on the Rights of Indigenous Peoples by the Human Rights Council in 2006. Written for both interested laymen and specialists, the book outlines the scope of international indigenous rights necessary for the survival of indigenous peoples and uses these as a benchmark to evaluate the development of international indigenous rights over the last five centuries. The analysis highlights the dark period of colonial expansion in which western concepts were used to dispossess, marginalize, assimilate and maltreat indigenous peoples - instead of protecting their way of life. It also appraises the later involvement of international organizations such as the International Labour Organization and the United Nations in protecting indigenous rights. The booklet argues that while indigenous rights continue to be violated and indigenous peoples themselves still face substantial challenges, international law, somewhat reassuringly, is headed in the right direction. Yogeswaran Subramaniam, LLB (Hons) (London), CLP, C DipAF (ACCA), MBA (Southern Queensland), LLM (Malaya), was previously an Advocate & Solicitor of the High Court of Malaya (1991-1998) and a Corporate Legal Advisor for two major financial corporations (1999-2005). He currently lectures at SEGi College, Subang Jaya, Malaysia and is looking to pursue a doctoral thesis in Indigenous Affairs.